I've you've clicked through from Dare to Dream, welcome to my blog! I was thrilled to have the opportunity to write a guest post for Whitney. Whitney is a dear friend and an invaluable sounding board. She's encouraged me to tell my story in a cabaret show I recently put together (and then played the piano for some performances - including a performance coming up in Utah) and has constantly urged me to follow any dreams or ideas I have. It was because of Whitney's encouragement that I decided to take the plunge and start my own photography business. The most amazing thing about Whitney is that everyone who knows her feels she is their personal cheerleader. She gets so excited about you and your gifts and your ideas and is able to help you discover things about yourself that you didn't know were there. She's an inspiration to me. 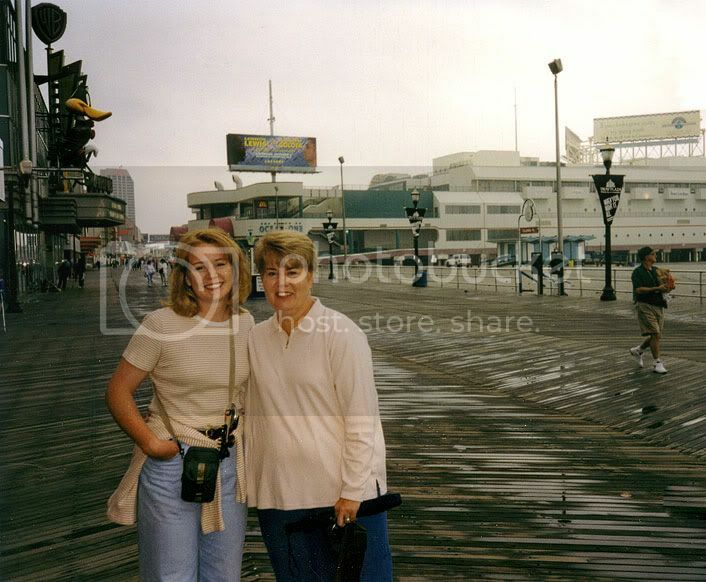 I realized as I was writing my Dare to Dream post that I don't have very many pictures of my mom and I. I have a lot of pictures of her around my home - mom with one of my siblings, mom with Katie Couric when we visited the Today Show. I have the photos from our last photo session together. (That was a blessing - we had professional portraits taken a week before she died. My brother was leaving on his mission and we didn't have recent pictures. We're so grateful for those pictures now.) But, I don't have any pictures of the two of us in my home and frankly, I couldn't think of the most recent picture I have of just the two of us. I went looking through my scrapbooks and found it. I really am sad I have so few pictures of the two of us. I'm envious of the pictures my brother and sister have with her. I know the lack of pictures isn't a reflection of how we felt about each other - she just hated being in pictures. So much so, she was known to cut herself out of pictures if she didn't like the way she looked. And haven't we all been tempted to do that? I love being a photographer. I love creating photos that reflect the relationships my clients have with each other. I love documenting my own family as they grow. But if I'm being honest, I hide behind the camera when it comes to taking pictures of my family. I take the pictures because I don't want to be in the pictures. I don't want to be reminded that I haven't been exercising. I don't want to see the proof that I ate at too many drive-thrus when I was pregnant and still haven't lost all the weight yet. But I want to leave behind a different photographic legacy to my son than was left to me. So, my challenge to you to embrace the photographic hassle and to get out from behind the camera is also my challenge to me. So, I'm buying this tripod to start taking self-portraits and more pictures of me playing with my son. And I'm making plans to have professional pictures taken later this summer. Happy picture taking! Feel free to visit again! I post recent photo sessions, pictures of my family, Photoshop tips and shots from personal photography projects on this blog. I also have a family blog that I've kept for a couple years now. If you like American Idol or So You Think You Can Dance, you might want to check out my episode recaps (new SYTYCD performance recap after tonight's show!) on that blog. Have a fabulous day!